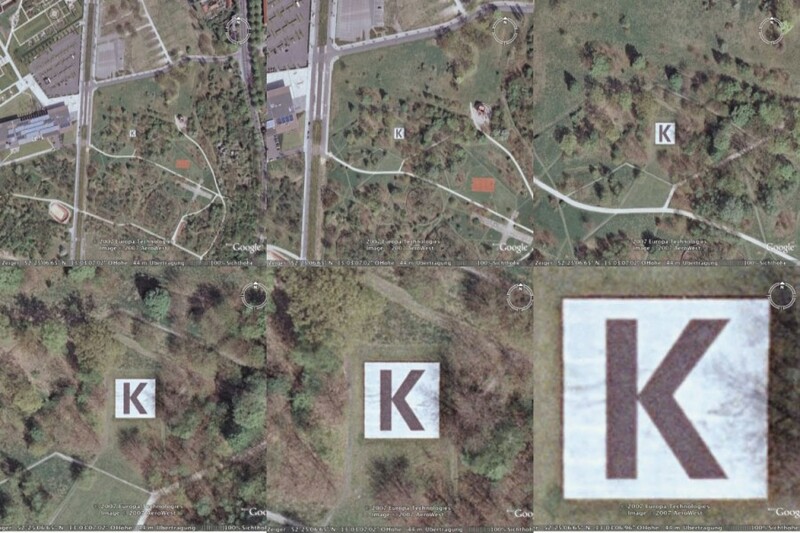 On the BUGA Potsdam 2001 map all the works of art are signified by a black "K" in a white square. The black "K" in a white square was used as a symbol in the BUGA 1999 Magdeburg map. 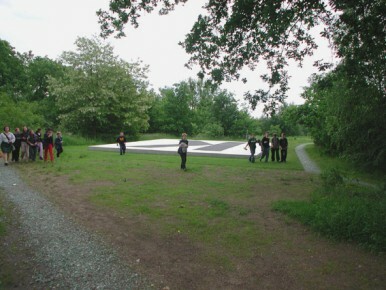 The symbol K cited in the map of the BUGA 2001 is meant to help the visitors locate all of the artworks on the BUGA grounds and refect the art in itself and in context of cultured nature. This symbol has been reconstructed to scale on the BUGA grounds. The Waldpark was selected as the location since it serves as a grown contrast to the precisely constructed pedestal sculpture. The surface of the concrete platform is covered with black and white street paint. Glass dust causes the surface to reflect light. The "K" stands in general for art (Kunst) and as such is differentiated from the nature that surrounds it. "K" is also the concrete signification of the material used (Konkret-concrete). This concrete sculpture can be understood traditionally and in contemplation, and thus remain untouched. In addition it can also be understood as a sculpture that one can walk on or sit upon (besitzen = to own, to "take" a seat). Visitors who sit or stand on the pedestal become a part of this artistic plan. For the moment of their presence the various visitors are incorporated as the living part of the sculpture. Thus the clear delineation in the interpretation between art and nature can be dissolved.